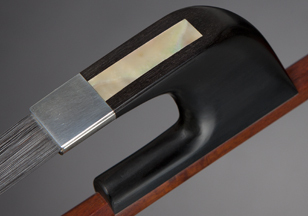 We're delighted to offer a nice selection of Reid Hudson bass bows here. There is no other bass bow maker as successful and prolific as Reid! You can find at least one of his fine bass bows in just about every professional orchestra throughout the USA and Canada. Reid makes his home on Vancouver Island and is super easy (and accommodating) to work with. Because of this, I think he has always been very receptive to what professional musicians need in a good responsive bow. His bows are on the highest level and always play dependably well. We offer both of his French bow models, the Bottesini and Tourte model. 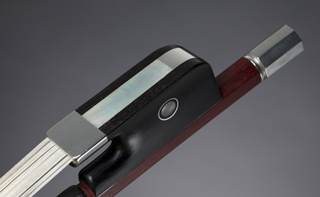 We also love his Pfretschner model bass bow. The Hudson bows (French) tend to hover between 133-140 grams, but mostly fall around 137-ish. He's made a lot of bows and knows how they work. Before finishing a bow, Reid tries each one individually to make any final adjustments in weight or camber. Here the photos are big and detailed! Click on any photo. Reid Hudson French Bass Bow (Bottesini model)- This is Reid's longer model 65.7 cm and the playing length (hair) is around, 54 cm. This one weighs 140 grams, though they usually average around 137-ish grms. This one of Reid's typically nice bows: Well made and elegant. We love the beautiful long sweeping tip on these. $4,500 Only one left in stock! Because of demand, our stock can fluctuate with sales and re-stocking. We always try to have at least one model of each bow on hand. For additional information feel free to email us or call, 800-600-2689.